Tonight's the first round of the NFL Draft and it's one of my favorite nights of NFL TV. The draft experts thinks the Packers will probably go with a defensive linemen in the 1st round and then look for a center, tight end, and safety in the later rounds. I wouldn't be surprised to see a wide receiver picked as well. My favorite night of NFL TV should only be combined with one of my favorite Packers cards from the past few years. 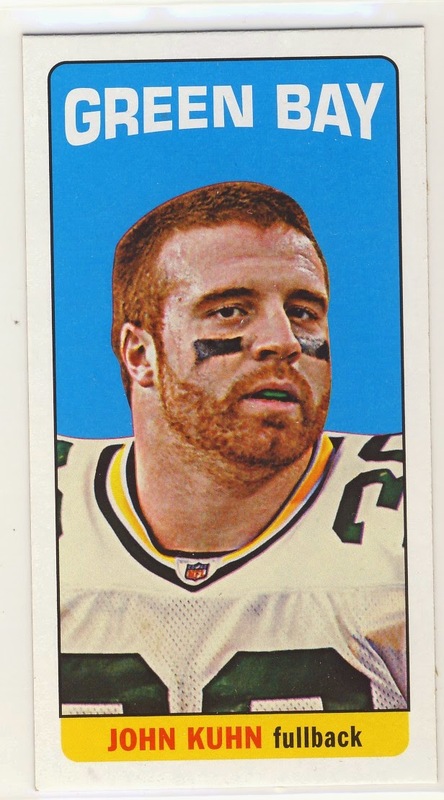 This is a Tall Boy John Kuhn from 2012 Topps which mimics the 1965 Topps Tall Boys. Sadly it looks like there wasn't an autographed version of it. I like our (Green Bay) pick of Clinton-Dix. What do you think? I'm excited about it! I'm no draft expert but I was surprised he was still available for us!